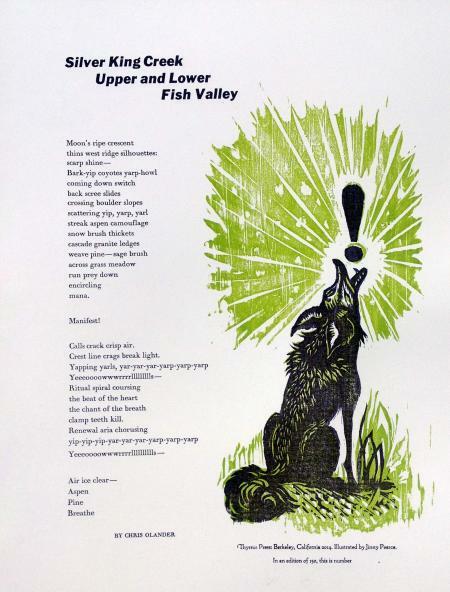 Thyrsus Press is a fine art print shop and publishing house in Berkeley, California. We make artifacts of all sorts — books, broadsides, mail art, buttons, curious ephemera, and more. We use a combination of traditional print media: engraving, etching and relief, alongside texts usually hand set in lead type with a deep respect for typographical history. Imagery is created by engraving, etching, linocut, collagraphs, and solar plate (photo etching). Our shop is currently equipped with a 1914 Chandler & Price 12x18 platen press, a Conrad Etching Press, and a Vandercook 01 Proof Press.